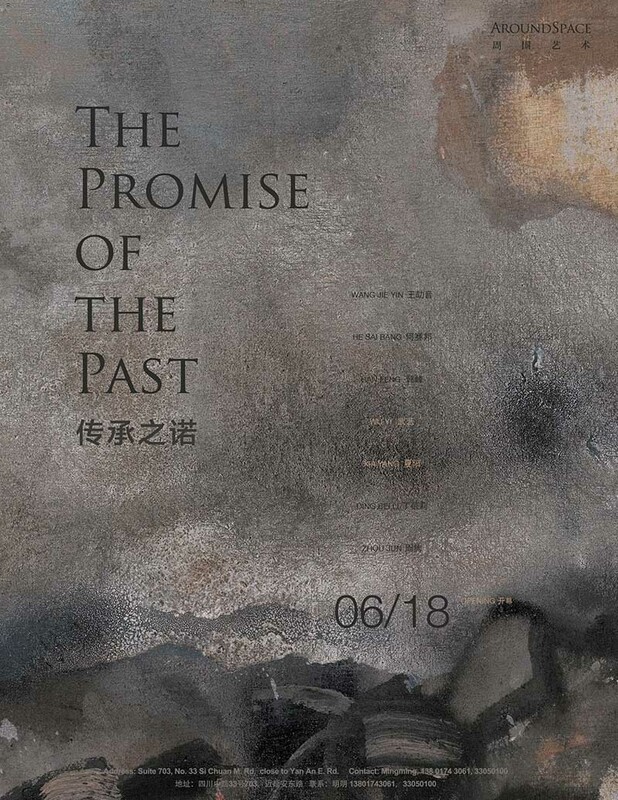 AroundSpace Gallery is pleased to present The Promise of the Past, a group show of eight artists: Beili Ding, Feng Han, Saibang He, Jieyin Wang, Yi Wu, Yang Xia, and Jun Zhou. The exhibition examines the interpretation and reformation of traditional ink painting in diverse media, as well as the contemporariness and avant-garde-ness of the concepts and spirit of ink painting. Tradition can be burdensome. When Chinese artists encounter the intense legacy of traditional ink painting, to inherit or to reject it is not only an intimate personal choice, but also a grand collective proposition. In his iconic book, Beyond Representation: Chinese Painting and Calligraphy 8th-14th Century, Wen C. Fong pointed out that in Western art history classicism describes the Greco-Roman ideal; but in the history of Chinese art, no single period of antiquity represents a prescriptive classical norm. Today's artists are talking about learning from tradition and classical art. Intellectuals in the late Ming-early Qing dynasties advocated the style of epigraphic calligraphy made by anonymous craftsman in earlier times. Even the art critics in Tang Dynasty (618-907 AD) worshipped the archaic aesthetics created by previous artists. Therefore, the classical tradition of Chinese art is fluid and ever-changing. The art made by each generation could become classical and traditional in the eyes of future artists. Hence every generation of artists is unique and critical, as they serve as a bridge that links the past and the present. They carry the promise of the past and the inspiration of the future. 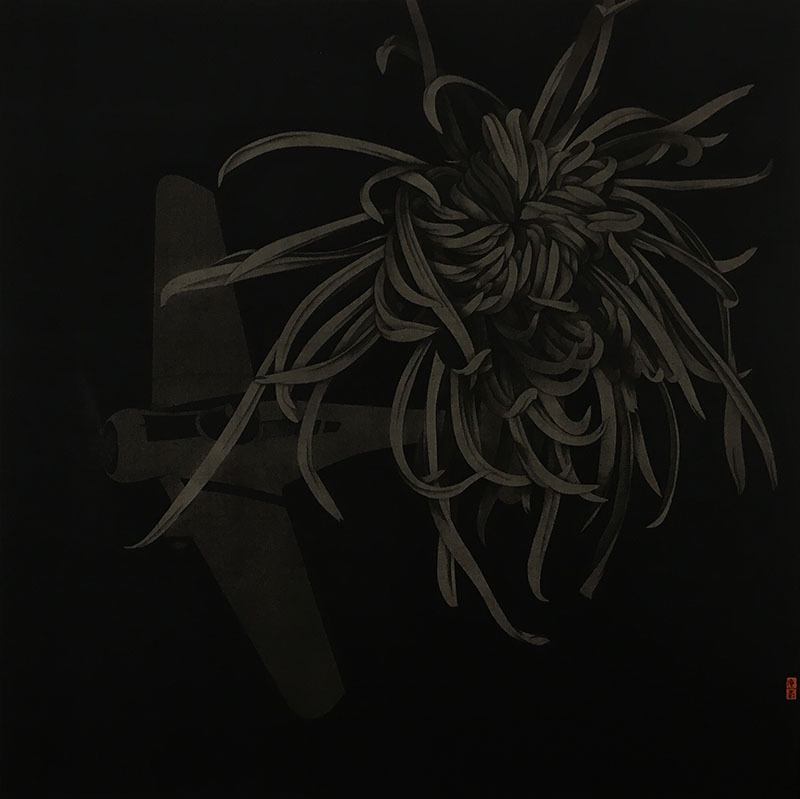 Among the eight artists shown in the Promise of the Past, Jieyin Wang is the oldest. Although his works presented here are made of acrylic paints on canvas, their essential idea comes from ink painting. His expressive brush strokes evoke the Expressionist style. Saibang He exemplifies Minimalism aesthetics with ink and water, creating a lofty space on Xuan paper. Yang Xia twisted paper strips into ropes and glued them on metal plate before painted on them. His slow and labor-intense process added performative and conceptual elements to his final work. 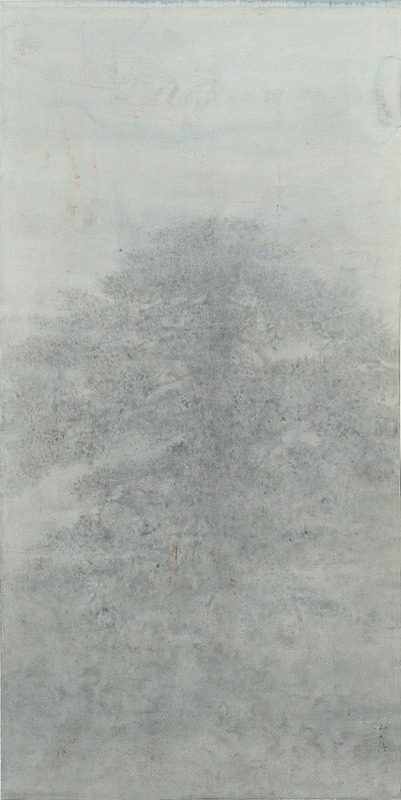 Beili Ding's sensitive yet unsophisticated personality and her strict traditional Chinese painting education reconfirmed her choice of ink painting as her artistic medium. 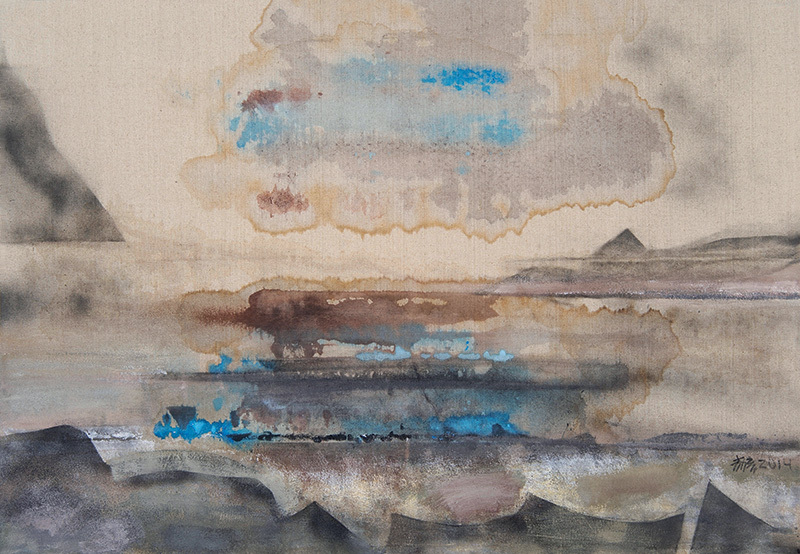 Naturally, contrary to following the doctrine, she uses photography to capture her objects, reduces tracing outlines of images, and applies "mogu manner" (an ink painting skill that emphasizes washes instead of lines) in landscape subjects, successfully adapting traditional technique into her own visual vocabulary. Both Feng Han and Jun Zhou adopt Gongbi (a careful realist technique in Chinese painting) as their main technique. Han uses silk and Zhou uses rice paper as foundation. From his Made in China series a decade ago to most recent Blossom in Distant Lands, Han absorbs the finest techniques and develops his own in order to capture current social and cultural issues as well as ubiquitous personal emotions. 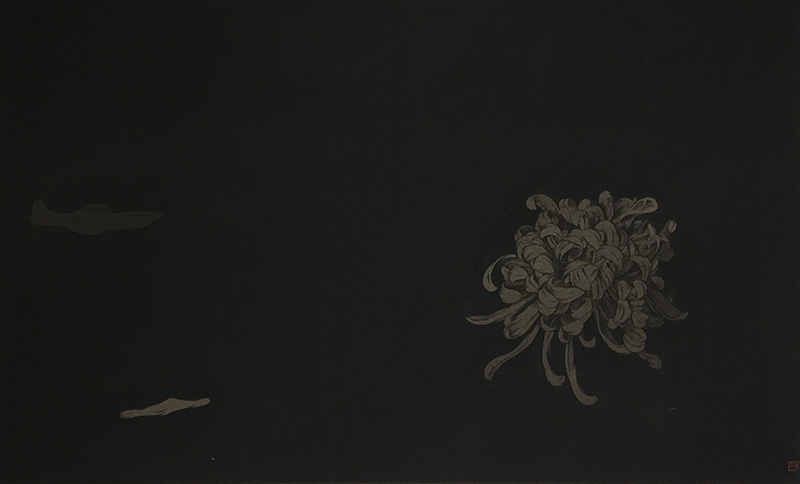 As the youngest artist among the group, Jun Zhou's meticulously executed works demonstrate diverse possibilities of traditional materials and techniques in today's context. 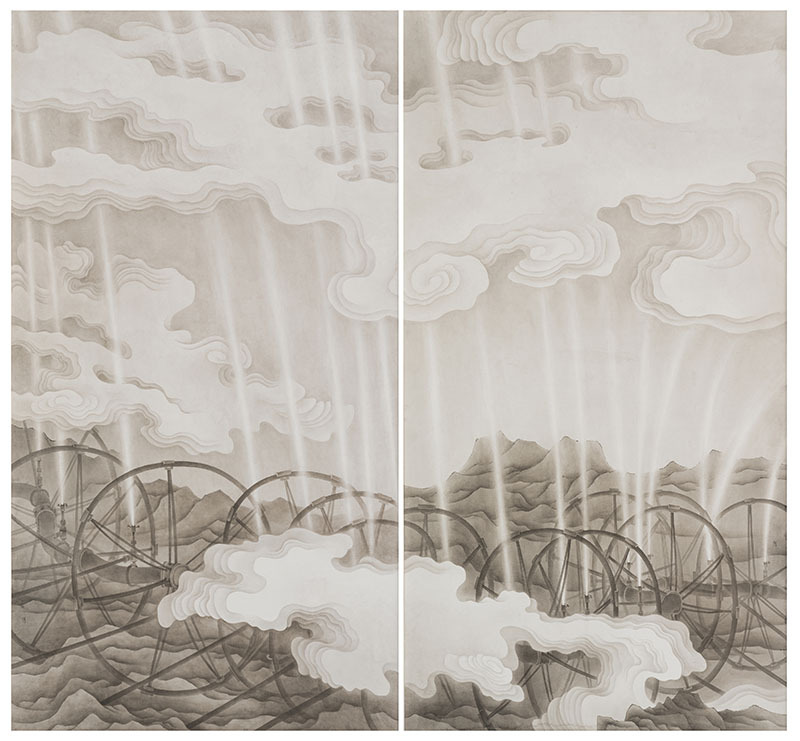 Yi Wu's work seems to be ink painting on paper at first glance, but in fact they are etched copper prints that can be reproduced multiple times. 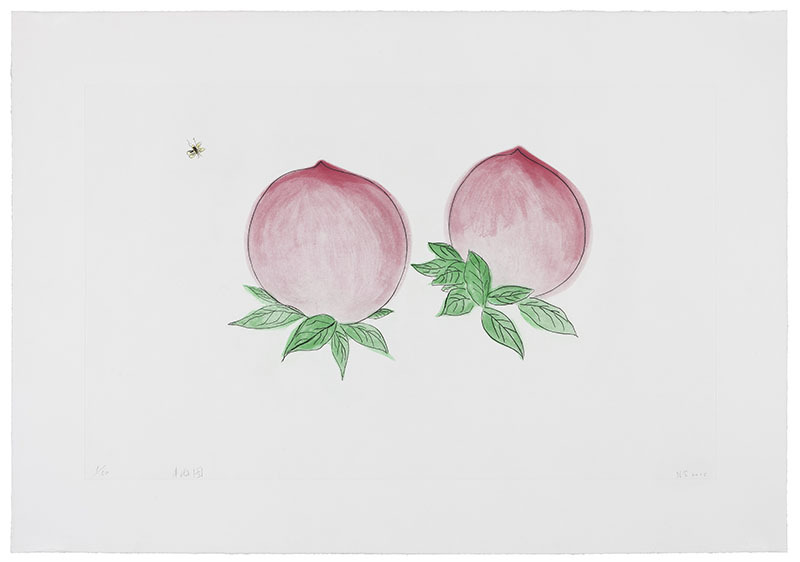 Wu reinterprets folk art motifs in his work, seeking a simple and subtle quality, instead of the incidental effects that occur in traditional ink painting. No matter the extent of artists’ awareness of self-expression or the artists’ pursuit for brushstroke and ink skills, many concepts and techniques developed in the history of Chinese ink art are timeless. Such ideas are not much different from Western, or contemporary art. The Promise of the Past juxtaposes artworks made in various media by artists of different generations, and showcases their achievements and contributions to inherit the spirit and expand the boundary of classical Chinese ink painting. If our efforts could be of some help to contemporary Chinese ink painting, our original goals are achieved.